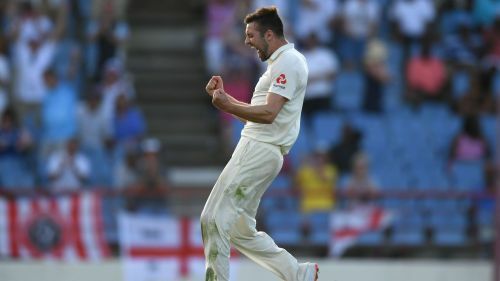 Mark Wood said he felt like a "superhero" as he tore through West Indies in a ferocious spell to set up a consolation Test victory for England in St Lucia. The paceman's career has been blighted by injuries, but he made up for lost time by claiming a maiden five-wicket haul with first-innings figures of 5-41 last weekend. Playing his first Test since last May, Wood provided the hostility the tourists had been lacking and the quick even surprised himself with the pace he generated in England's 232-run win. He told The Guardian: "You almost feel like a superhero. I've been playing Mario Kart recently and yeah, it's like when you get a magic mushroom and you're just absolutely flying." Wood added: "I'll never forget the feeling of that spell. If I'm ever down about my bowling I'll re-watch the highlights. "I've watched them about 20 times already – probably more. This will sound bad but seeing it back I just thought: 'Wow, that's me.' I couldn't believe how well I bowled and how fast it looked on TV. I was so happy." Wood's Man-of-the-Match left him feeling emotional after spending so much time in the treatment room over the years. "I held the ball up and felt so proud, then I got into the pavilion, had a hug with the physio Craig de Weymarn – he's touched me in places my wife never has! – and it all sunk in," said the 29-year-old. "It was everything I'd wanted after all I'd been through with injury. I know it's only one five-for and there's Jimmy [James Anderson] and Broady [Stuart Broad] with tons of them, but it was so special. "I felt I finally belonged in the England Test team. I put the ball in my England cap, sat them next to me and just looked at them. All the emotions came out. I was a bit teary."